Hi friends! Combination of Chana dal and pumpkin is highly nutritious, has a rich flavour and aroma, is amazingly delicious and gets easily digested. In a pressure cooker heat a tablespoon of cooking oil, add cumin seed, wait till starts spluttering, add asafetida fry for few second till turns pink. Add the chana dal with water and turmeric, chili powder powder . On a full flame place the pressure cooker on the stove. The moment pressure is formed, reduce to low flame, cook for twenty five minutes. switch off the stove, let the pressure cooker cool to room temperature. Open the lid of the pressure cooker, dal is well cooked, keep aside. Take a pan, heat ghee add the cumin first and fry for a few seconds, add the onions and fry till they become light brown, add the garlic and fry till golden. Add coriander powder, fry for few seconds, add clove and Black cardamom powder. Add pumpkin pieces, fry for 3-5 minutes, now add the tomatoes, ginger, stir and sauté on low flame till the tomatoes get cooked and the oil starts to leave the side of the mixture. Pour this tempering mixture on the dal, stir and simmer the dal for 10-15 minutes till dal is well blended, the dal is neither thick nor thin. Add fresh lime juice.Garnish chana dal with chopped coriander leaves. Serve the chana dal hot with basmati rice pulaos or with any of the Indian breads. The consistency of the dal can be easily adjusted, if the dal becomes thick, then after adding the tempering, add some water and simmer for some minutes or if the dal become thin, simmer for a longer time so that you get the right consistency. Consuming fruits and vegetables of all kinds has long been associated with a reduced risk of many lifestyle-related health conditions. Many studies have suggested that increasing consumption of plant foods like pumpkin decreases the risk of obesity and overall mortality. It can also help stave off diabetes, heart disease, and promote a healthy complexion and hair, increased energy, and overall lower weight. Pumpkin is one of the best-known sources of beta-carotene, a powerful antioxidant that gives orange vegetables and fruits their vibrant color. Beta-carotene is converted to vitamin A in the body once it is eaten. Chana dal is high in fiber and helps to lower cholesterol. It also has a very low hypoglycemic index, which is important for those with diabetes. Chana dal is a helpful source of zinc, folate, calcium and protein. It is low in fat and most of it is polyunsaturated. 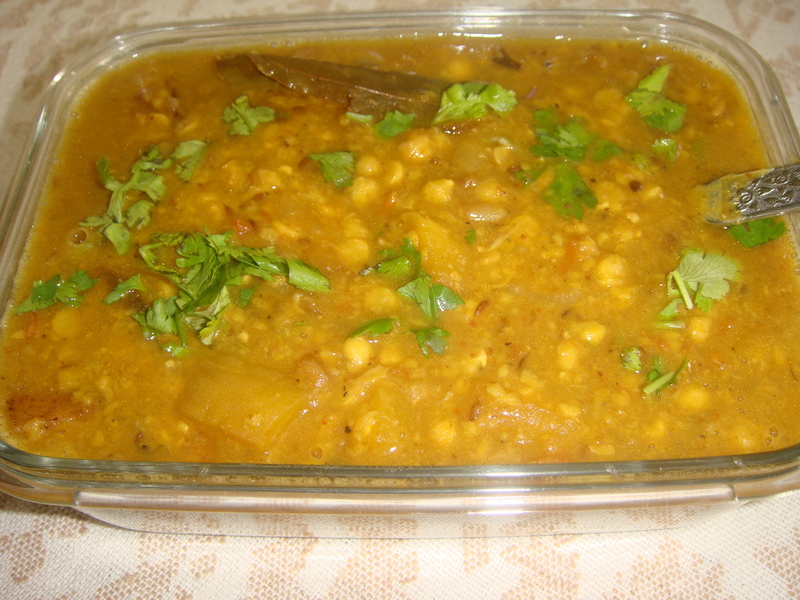 Chana dal is extremely delicious in taste, full of nutritious and can be digested easily.